Sculpt me silly... or "how to make a really old model look less old"
While my brains running in ZBrush mode, I figured why not apply the same techniques I covered in class today to a character model. The challenge tomorrow for my students will be to use the basic work flow and tools to take the low-poly model I built and give it some "oomph". Afterall, the work flow is no different - subdivide, build form and mass, smooth and refine... Ad infinitum. This is about an hour and a half in ZBrush. 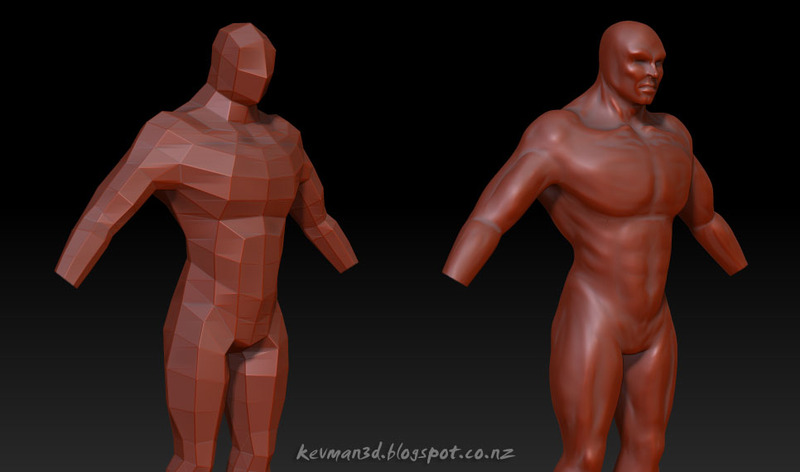 I realise that its not anatomically accurate (more an eyeball of what I thought might be correct), but as a practice run its served a purpose in that it pointed out a few things that could be better with that base mesh (primarily finishing up the head so subdividing it gets the extra geo where it needs it). The base mesh I built last year - mostly to try a few alternate approaches to modeling low-poly base geometry for game characters - based on wire frame screen shots I'd seen online. 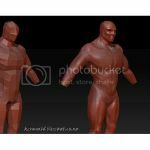 It never hurts to look at new ways to structure your model topology and then build it yourself - its how you pick up those concepts and techniques that can be incorporated back into your personal work flow and grow you as an artist.